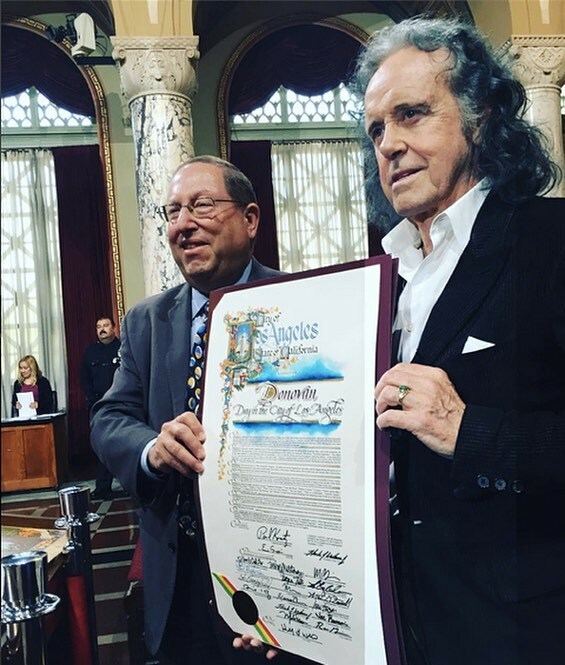 Thank you Mayor Eric Garcetti and Councillor Koretz of City Hall Los Angeles for this singular honor to mark the Fiftieth Birthday of my song SUNSHINE SUPERMAN reaching number one on the Billboard Top 100. A love song for Linda yes, but also when we met we both knew we were on the same journey to raise awareness of a higher consciousness for the future generations. We are still on that journey. Come to my 21 city SUNSHINE SUPERMAN AMERICAN TOUR and share this birthday with me. New York, NY – February 11, 2014 – Musical titans Donovan, Ray Davies, Graham Gouldman, Mark James and Jim Weatherly will become the latest inductees of the Songwriters Hall of Fame at the organization’s 45th Annual Induction and Awards Dinner. These legendary songwriters wrote such mega-hits as “Mellow Yellow”, “You Really Got Me”, “For Your Love”, “Suspicious Minds”, and “Midnight Train to Georgia”. The star-studded induction event is slated for Thursday, June 12th at the Marriott Marquis Hotel in New York City. Additional special award honorees will be announced soon. Scottish singer-songwriter Donovan was discovered by Ralph Peer Jr. in 1964, and was soon in the pop charts with his first hit “Catch The Wind,” which garnered him the Ivor Novello Award for songwriting. Donovan and producer Mickie Most then collaborated on other chart-topping songs including “Sunshine Superman,” “Mellow Yellow” and “Hurdy Gurdy Man,” all of which landed in the Top 5 on the Billboard Hot 100 chart. In 1965 Donovan became the first artist Clive Davis signed to CBS/Epic Records. Donovan’s hits, along with many of his other songs including “Atlantis,” “Catch The Wind” and “Season Of The Witch,” have been featured in films and TV shows such asGoodfellas, Dark Shadows, The Simpsons and Futurama as well as in major advertisements for General Electric, The Gap and Microsoft. He also served as the musical composer for the films Poor Cow, Brother Sun, Sister Moon and The Pied Piper.Throughout his career Donovan has collaborated with Paul McCartney, George Harrison, Ronnie Wood, Jeff Beck, among others. Donovan was designated as a BMI Icon in 2009 and was inducted into the Rock and Roll Hall of Fame in 2012. I am delighted to receive this honour from the land of my birth. To know the reasons for my delight and my acceptance speech see the video. The music on True Blood always gets us in an appropriately bloodthirsty mood, so it’s no wonder that the True Blood: Volume 3 soundtrack received a Grammy nomination! True Blood will go up against Boardwalk Empire: Volume 1, Burlesque, Glee: The Music, Volume 4, and Tangled in the Best Compilation Soundtrack For Visual Media category. The article below is taken from The Rolling Stone Magazine and is a recent interview with Donovan on discovering that he is to be inducted into The Rock N Roll Hall of Fame. Andy Greene: Tell me your first reaction to hearing the news. Donovan: It’s a singular honor, and I’m pleased as punch, as they say in England and Scotland. It’s even more special because I’m going to be there with some of my favorite artists and musicians. The Faces are my old chums. We used to hang out. The Chilis, some of them appeared on my Rick Rubin album. Guns N’ Roses, who I’ve come to know in California and did a couple of things with. Of course, the Beastie Boys. A very touching part of this, for me, is the inclusion of the lovely Laura Nyro, who left us too soon, of course. When I was younger, I followed her rise and her extraordinary work. It will be great to see her honored too. Andy Greene: This is a honor that’s long past due for you. Donovan: Oh, I’ve been honored from day one. Basically, as a young singer/songwriter/poet arriving at the time that I did – from out of the bohemian world and onto the popular stage – immediately I felt honored. Recognition of one’s work comes from the fans first, of course. My goodness, that’s been again and again recognized. You can read more about Donovan to be inducted into The Rock N Roll Hall of Fame on his friend, Chris Murray’s website here. I am honoured to be nominated for the second time to The Rock & Roll Hall of Fame and chuffed to see my young chums The Faces nominated too! Donovan received the Lifetime Achievement Award at the BBC2 Radio Folk Awards. After a speech where he talked about his Glaswegian and Irish roots, the ‘lament’ and the heroic celtic ballads, Donovan played a short version of Summer Day Reflection Song followed by Catch The Wind, accompanied on double bass by Danny Thompson (2007 recipient of the Lifetime Achievement Award). Earlier in the day Donovan appeared on the morning TV program BBC Breakfast where they showed a few seconds of some rare footage from the mid-70′s. A few hours later Donovan was interviewed on the Simon Mayo radio show, and he talked about the award and his current activities (with no mention whatsoever about his new album Ritual Groove except for the collaboration with David Lynch almost a year ago). He also played Colours. Donovan was presented with the Mojo Maverick Award on July 21st 2011 in London at the Mojo awards by Jimmy Page. This award recognises people who have been hugely influential over a number of years, inspiring a number of different genres of music in the process. Donovan will be named a BMI Icon at the U.S. performing right organization’s annual London Awards, slated for Tuesday, October 6 2009 at London’s Dorchester Hotel, Park Lane. The invitation-only gala will recognize the U.K. and European songwriters and publishers of the past year’s most-played BMI songs on American radio and television. Broadcast Music Inc. (BMI) is a United States-based performing right organization that collects and distributes monies for the public performance of music on outlets including radio, television, the Internet and the top-grossing tours in the U.S. The Icon designation is given to BMI songwriters who have bestowed “a unique and indelible influence on generations of music makers.” Donovan joins an elite list of past honorees that includes multi-genre nobility Bryan Ferry, Peter Gabriel, Ray Davies, Van Morrison, the Bee Gees, Isaac Hayes, Dolly Parton, James Brown, Willie Nelson, Hall & Oates, Paul Simon, Crosby, Stills & Nash, Steve Winwood and more. Donovan is a master of poignant simplicity. Capable of evoking passionate idealism and freewheeling emotion in a single word or chord, he transformed popular music in the 1960s and went on to build a legendary career. Already a folk hero in the early 60s thanks to hits including “Catch the Wind” and “Colours,” Donovan proceeded to generate considerable radio success for the rest of the decade with 11 consecutive Top 40 hits, including “Mellow Yellow,” “Sunshine Superman,” “Wear Your Love Like Heaven,” “There Is a Mountain,” “Lalena,” “Epistle to Dippy,” “Atlantis,” “Hurdy Gurdy Man,” and “Jennifer Juniper,” all of which he wrote alone. While “Jennifer Juniper” has generated more than 1 million performances, “Mellow Yellow” has earned more than 2 million and “Sunshine Superman” has garnered almost 3 million performances. His compositions have also resurfaced in hit films and television series including Goodfellas, Election, Dumb and Dumber,Rushmore, The Simpsons, Nip/Tuck, Ugly Betty, Clueless, Boys on the Side, Murphy Brown, My Name is Earl and Dancing with the Stars. Donovan has numerous Advertising success with his songs ,most notably the G.E. commercial for Wind Energy , in which his song ‘Catch The Wind ‘ was highly praised. He was profoundly influential on the Beatles, becoming one of an elite handful of artists who collaborated on songs with the band. In 1965, “Catch the Wind” earned an Ivor Novello Award for best contemporary folk song, marking the first time the honor was bestowed on an artist’s debut single. Donovan received an Honorary Doctor of Letters from University of Hertfordshire in 2003, and in 2009, he became Officer of the Order of Arts and Letters from the French Republic and garnered the American Visionary Art Museum Baltimore’s prestigious Grand Visionary Award. A man not only of unfathomable talent but of rare conviction as well, he is a well-known proponent and student of Transcendental Meditation and leads the musical wing of the David Lynch Foundation for Consciousness-Based Education and World Peace. Hard at work on a new album entitled Ritual Groove, Donovan plans to tour the world 2010 through 2011. While BMI collects royalties for him in the United States, Donovan is a member of British performing right society PRS for Music. Hosted by BMI President & CEO Del Bryant; BMI Senior Vice President, Writer/Publisher Relations Phil Graham; and Executive Director, Writer/Publisher Relations, Europe & Asia Brandon Bakshi, the BMI London Awards will also present the Robert S. Musel Award to the writer and publisher of the most performed song of the year. BMI will also bestow “Million-Air” certificates on writers and publishers whose songs have achieved more than three million U.S. radio and television performances — the equivalent of more than 17 years of continuous airplay. extraordinary Sapphographs, a tribute concert celebrating Donovan’s music with Donovan as headliner, and the Irish premier of the documentary feature ﬁlm, Sunshine Superman: The Journey of Donovan. Donovan’s Sapphographs have been exhibited at Govinda Gallery in Washington DC, The Embassy of Greece, Washington DC, and at the American Visionary Art Museum in Baltimore Maryland. A tour of Donovan’s Sapphographs in Greece is scheduled for the summer of 2010. Donovan in Concert on Saturday 11th July 2009. The historic Ramor Theater is the venue for the Irish premier of director Hannes Rossacher’s documentary feature ﬁlm on the life and work of Donovan. This screening will be followed by a discussion with Donovan and his wife Linda Lawrence, moderated by Donovan’s friend and exhibition curator Chris Murray. Sunshine Superman: The Journey of Donovan depicts the extraordinary life of 60´s folk-pop phenomenon Donovan. An amazing success story covering a career spanning more than four decades of Donovan’s life, Sunshine Superman is full of rare anecdotes about colleagues, musical collaborators and friends. This award-winning ﬁlm also features appearances by Bob Dylan, The Beatles, Pete Seeger, Arlo Guthrie, Mickie Most, Rick Rubin, Jimmy Page, Jeff Beck, ﬁlm directors Franco Zefﬁrelli and David Lynch, and many more. The Donovan Days celebration will be complimented with an exciting and varied line-up of workshops and performances for children and adults at the Cavan County Museum complex. Donovan Days will be a unique opportunity to meet one of the most creative artists of our time in intimate surroundings as he shares his music, art and song with us.